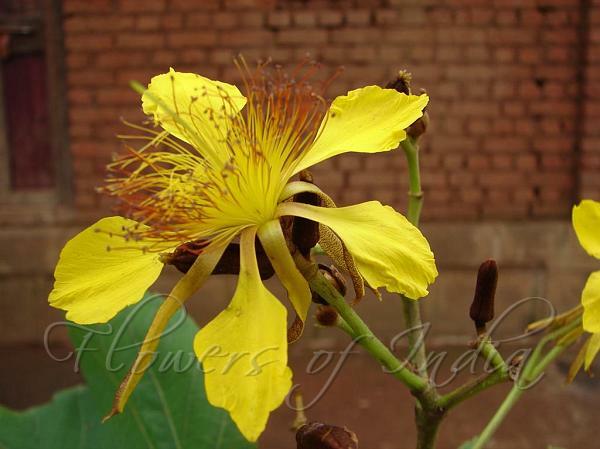 Jangli Bhendi is a tree, 5-6 m tall, clothed with starry hairs, with big yellow flowers. Large alternate leaves are irregularly lobed. Fruit is eaten, and is an important famine food. Flowers have 5 large spoon-shaped petals, which are narrow at the base. A dense spreading mass of stamens emerges from the center. Flowers are 5-7 cm across, borne in lax panicles at the end of branches. Fruit is 4-5 cm long, 3 winged, heart shaped, covered with long stiff prickles. 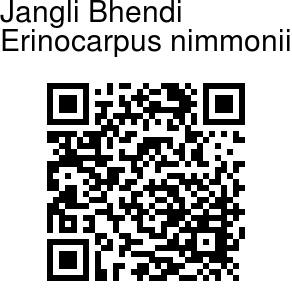 It is common in Western Ghats. Identification credit: Pravin Kawale Photographed in Lonavala, Maharashtra.